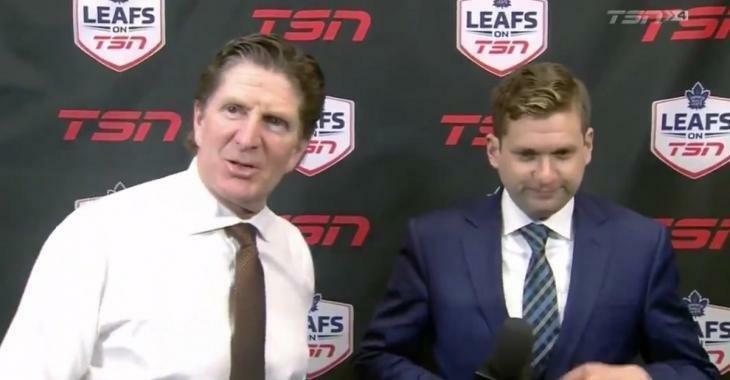 Videos : Mike Babcock roasts TSN reporter with the cameras rolling. Mike Babcock roasts TSN reporter with the cameras rolling. No mercy from Mike Babcock. One National Hockey League reporter got a bit of a surprise on Friday was he was the victim of a surprise roasting, one emanating from a rather surprising source. The Toronto Maple Leafs suffered another tough loss on Friday night when they eventually lost in overtime to a Detroit Red Wings' franchise that they no doubt had expectations of beating, and this in spite of some late game heroics from veteran forward Patrick Marleau. The loss continued a significant slump for the Maple Leafs who have now seen the large gap they once had over other teams in the NHL's Atlantic Division shrink to just 2 points. Now obviously this has to be a frustrating situation for the Maple Leafs' upper management but it also has to be a very frustrating time for Maple Leafs head coach Mike Babcock, especially considering the loss was to his former team. Perhaps it was for this reason that Babcock was looking to blow off a little steam after the tough loss and unfortunately for TSN reporter Mark Masters he was the man that Babcock chose as the target to do so. Masters was patiently waiting for a one on one interview with the Maple Leafs' bench boss after the game when Babcock casually strolled up to the interview and immediately began throwing daggers in Masters' direction. It was Masters shoes however that drew the most of Mike Babcock's attention and they did so in rather hilarious fashion. Almost as soon as he had arrived to the interview Babcock immediately began to chirp Masters' about the current state of his shoes. To be fair here they did appear to be in rather terrible shape, especially when compared to the cleanly polished shoes that Babcock was wearing right next to him, and in spite of whatever excuses that Masters' tried to produce to justify his shoddy shoes Babcock was just not having it. The well experienced head coach was quick to remind that Masters was reporting at the NHL level and that he should have more pride in his footwear, and he even ordered the TSN cameraman to get a good look at Masters' shoes. Of course the cameraman, who works for TSN and is Masters' work colleague not Babcock's, was quick to throw Masters right under the bus.